Maybe it’s just me, but it seems like dealers at this year’s National Automobile Dealers Association (NADA) convention in San Francisco are especially hungry for ways to build and, in some cases, preserve and protect their businesses. I’m told many of the workshops were full, and dealers got turned away for lack of seats. Part of the reason owed to fewer workshop options on the schedule. But I’d submit the packed rooms, and the number of dealers who arrived early to get seats, suggests keen interest in better ways to retail vehicles and make more money. I had the privilege of being a Distinguished Speaker this year, along with Alan Haig, president of Haig Partners. We addressed how the rise of the future of retail automotive may change as autonomous vehicles and ride-sharing arrive in earnest, and how dealers can prepare today to thrive in what will undoubtedly be a changed car business. Margin compression: Early this morning, I had a conversation with a dealer who asked for an in-store visit to help his team address a big problem: Last year, the dealership set sales volume records in new and used vehicles. But, despite all the effort and cars put over the curb, they lost money. Unfortunately, the dealer’s experience reflects a market in which simply selling more cars won’t make up for ever-smaller margins. I’ve been telling dealers you have to sell them more efficiently and smarter, which means making hard decisions about a vehicle’s retail fate much faster to mitigate margin compression. I think the strong interest we saw in the vAuto booth for Provision ProfitTime and our new vehicle solution, Conquest, suggest some dealers are taking this opportunity to heart. Technology efficiency: In his presentation, Alan Haig shared that, for many dealers, “technology is not treated as an ally to help profitability and efficiency.” Put another way, he’s suggesting that dealers often view technology as an expense, rather than a tool that can elevate performance. The mindset has troubling consequences that amount to sometimes significant investments in solutions that aren’t used to their fullest potential and, in some cases, get dumped as dealers look for ways to reduce expenses. Haig suggested that these dealers change their thinking and regard technology as a “frenemy” that can help them achieve their profit and sales objectives. Merchandising/sales efficiency: For the past couple years, there’s been talk about how dealers can use new technology and tools to market specific vehicles to specific customers who, through data science, are actually interested in purchasing the vehicle, and provide an online experience that minimizes the vehicle purchase pain points that continue to confound customers. 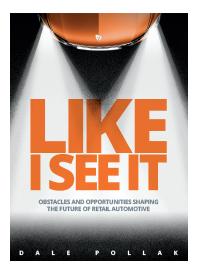 This year, it seems like dealers are more keenly interested in transforming how they market, merchandise and sell vehicles to meet customer expectations—a positive sign, I think, that digitally driven retailing has arrived, and it’s ready to make a difference for dealers who embrace. I am looking forward to what tomorrow’s NADA experience will bring. I’ll share my thoughts here.